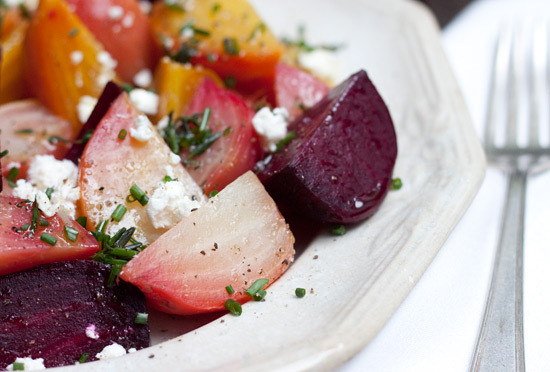 First Came Fashion: Beet & Chevre Salad. It's funny to me to post a beet recipe because up until this last year, I couldn't stand them (although honestly I'm not sure I ever tried them). Hot or cold, now I love beets and chevre so much, it's almost like dessert. Almost. Preheat the oven to 400º F and wrap beets individually in aluminum foil. Roast until tender when pierced with a fork (45 minutes to an hour, depending on the size of the beets. When cool, peel and quarter the beets and place on a serving platter (Use paper towels to peel red beets to avoid staining your fingers). In a separate bowl, mix together the thyme, chives, and olive oil. 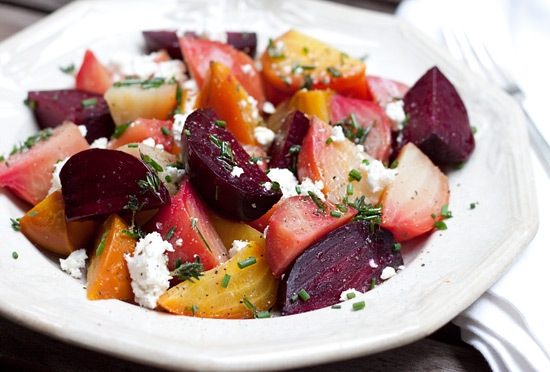 Spoon the oil and herb mixture over the beets, and season with salt and pepper. Top with the crumbled goat cheese and serve. This looks yummy! I must try this as soon as possible!